Several PSD officers who served under former President Mahinda Rajapaksa have been questioned by the Criminal Investigation Department (CID) over the murder of ruggerite Wasim Thajudeen. State Counsel Dilan Rathnayake informed the Colombo Additional Magistrate Nishantha Peiris on Wednesday that Udaya Nandana Nagahawattaarachchi who served in the PSD as a staff sergeant had been interrogated by the CID over the incident. Along with Nagahawattaarachchi, four other officers attached to the PDS who also served Rajapaksa when he was President have also been questioned. 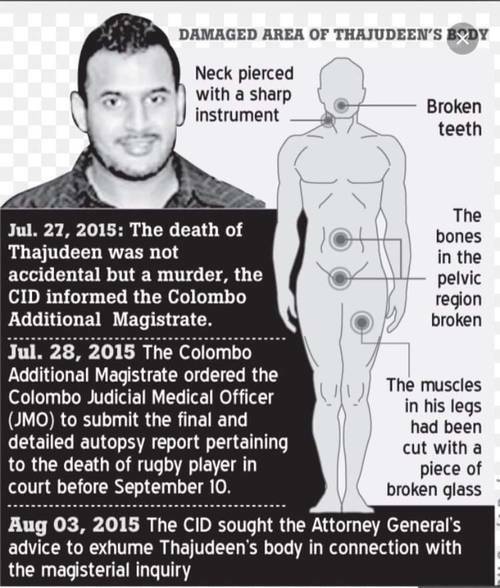 In February, Colombo Additional Magistrate, Nishantha Pieris ruled that Thajudeen was murdered, and ordered the CID to arrest the suspects in connection to his murder. Two sons of former President Mahinda Rajapaksa, Namal, who is a Parliamentarian, and Yoshitha, who is out on bail over a money laundering case at the Carlton Sports Network, are alleged to be involved in the incident. However, both have reportedly denied involvement. 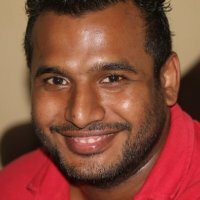 Six suspects, including ‘Captain Tissa‘, the personal chauffer of former President Rajapaksa, who also served as a bodyguard to former First Lady Shiranthi Rajapaksa, and their sons, Namal and Yoshitha have been identified as a possible suspect by CID. Former DIG Anura Senanayake and ex Crimes OIC of Narahenpita Police Sumith Perera are currently in remand for concealing evidence in the murder case. Thajudeen was killed in Colombo in May 2012. The mental agony of the family of Wasim Thajudeens is beyond imagination. I sincerely hope that this case should come an end as soon as possible and all culprits involved in the gruesome murder BE BOUGHT TO JUSTICE no matter how high and mighty they are. The entire Rajapaksa family is behind the murder of Wasim Thajudeen. Namal thottha baba is having high hopes one day he could be the leader of the country deceiving the village sinhala folks. Mudson you said it!! Bravo. But we ve been waiting to see when the FCID will start grilling Rajaakshe family on this since we know perfectly feel that few of the family were involved in the Thadju murder. This can be the real investigation to prove the unbiasedness of current judicial system of the country. We the right thinking …. justice seeking people of the island – have still been waiting real culprits to be caught by prevailing laws in the country. Allahu akbar – may all gods be on the right side of the victimized ones of the incident… may the tripple gem be blessed to all that make every efforts to support the justic right this critical juncture of the nation. If the good governance is supported by unbiased mechanisms – all the efforts should be made towards the dilution of the agony of the victimized family. But not the least towards that we the right thinking ones have not seen yet. So I really dont thnk that any good move will be made to corner real culprits of the issue- not only this case, but also other cases, that are being addresed right at the moment – give the feeling that none of these are focused on the JUSTICE yet, but the justice. All these pawns are just fall guys who may have done any dirty job to please their pay masters. CID need to clobber the mafia leader, the Godfather (or is it the king-father more appropriate). Hopefully, at least one of the pawn’s balls may offer the least resistance to pain, so that CID could quickly pick on the thread between the pawns and the Godfather(s), either one or a committee of 7, women excluded. Waiting ! waiting !! waiting !!! How long we have to wait until the Assassins are brought to book? Are we going behind a mirage? No matter how long they will take. The killers are living amongst us. They know that they have committed this gruesome murder. They might escape the long arm of law but not from their conscience. They ere already prisoners of their own conscience.